The products used were provided to me by Plaid Crafts via Blueprint Social. All opinions and comments are my own. 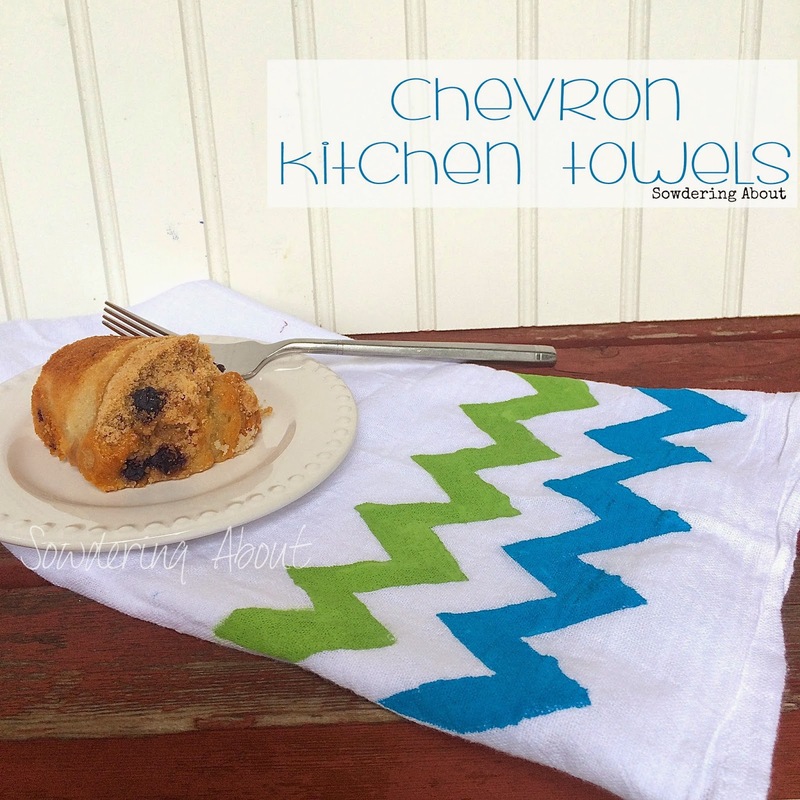 I feel like the one thing my house is always lacking is enough kitchen towels. One of the fun parts of living with two small children is although we have a shortage of kitchen towels, we always have an abundance of messes. So when I was invited to write a post for FolkArt and their stencils, it was a simple decision for me to make some fancy kitchen towels, because did you know that by using fancy towels, it helps clean the mess better? It doesn't, it really does (not). 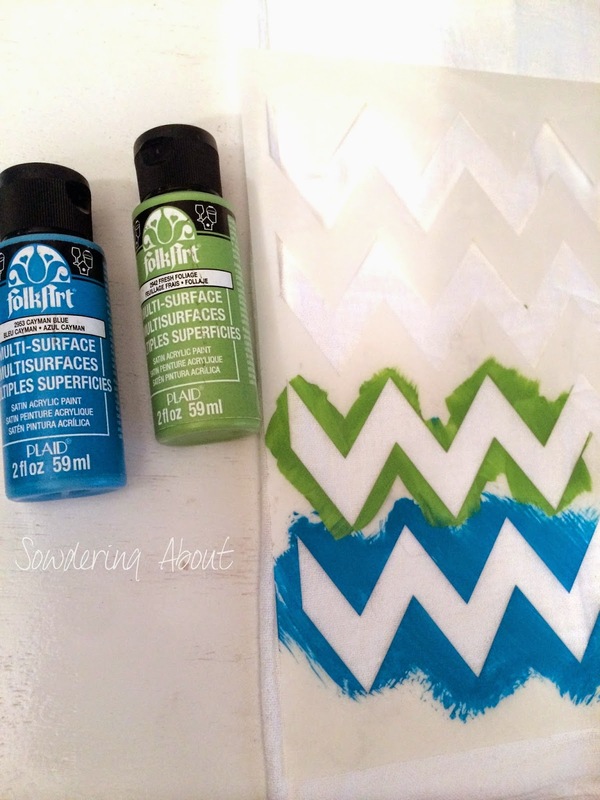 When we were sent supplies for this project, it was a random pick as to what stencil we would get, so when I opened my box of goodies, I was super excited to get this one in chevron print, because well, chevron is so in right now. I used the stencil adhesive on the back so it would stick to my towel. I was impressed with the adhesive since I had used it first on a ceramic tile just to see how it would work. A few days later when I did the towel, it was still sticky so I didn't have to reapply it. I decided to use blue and green out of the six colors I was sent because, you know, I've been trying to get into football and all, and with the blue and green being Seahawks colors, I knew I couldn't go wrong. Plus well, I really like blue and green, long before we moved here. And I knew I would love the pop of color in my kitchen. I put on a thin layer of paint onto the towel and when I was done, the stencil lifted off very easily without leaving any sort of residue behind. 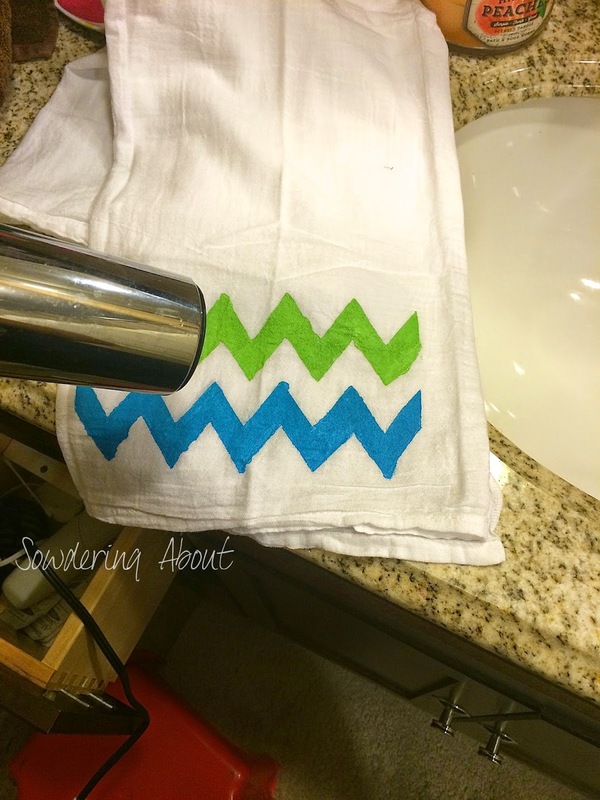 When I was done painting, I took the towel into my bathroom so I could use my blow dryer on it. 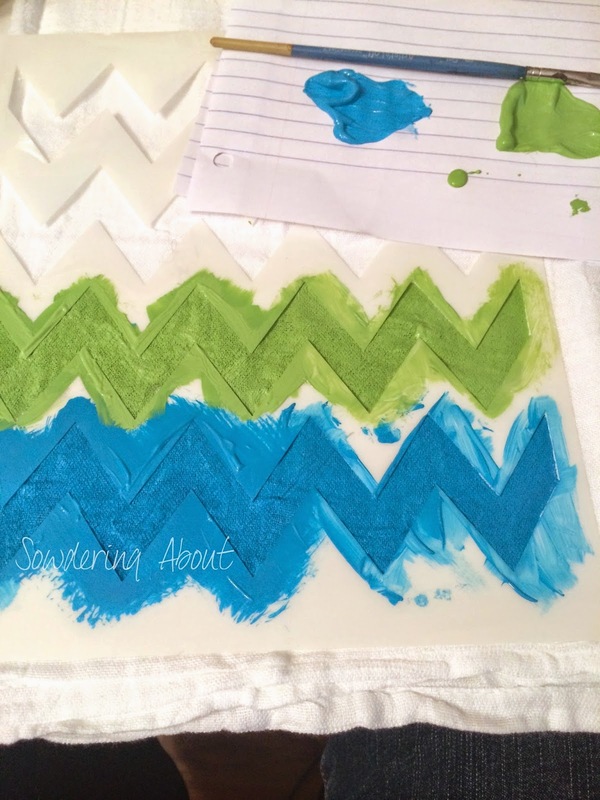 Heating up paint when you are painting on fabric helps set the paint. Now when I wash this towel, the paint shouldn't wash off. When all was said and done, I had this super awesome fun towel! 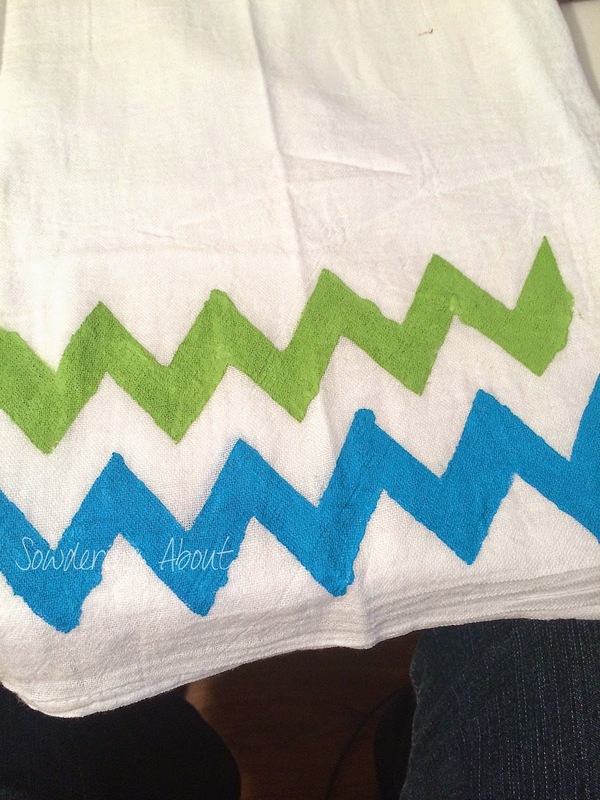 The pack of towels I bought came with four in them, so I think I am going to do another one but in fall colors so I can be not only trendy with my chevrons but seasonal too, gotta make sure to hit as many trends as possibly ya know ;). After I was done taking pictures, I got to hang it up on my stove where it will only live for a few hours because I am just waiting for the next spill. But this time when I clean up the spill, I'll be trendy when I do! Don't forget to check out and follow Plaid and Stencil1 on their social networks! funny how something so simple can make life so much better. What a great idea! 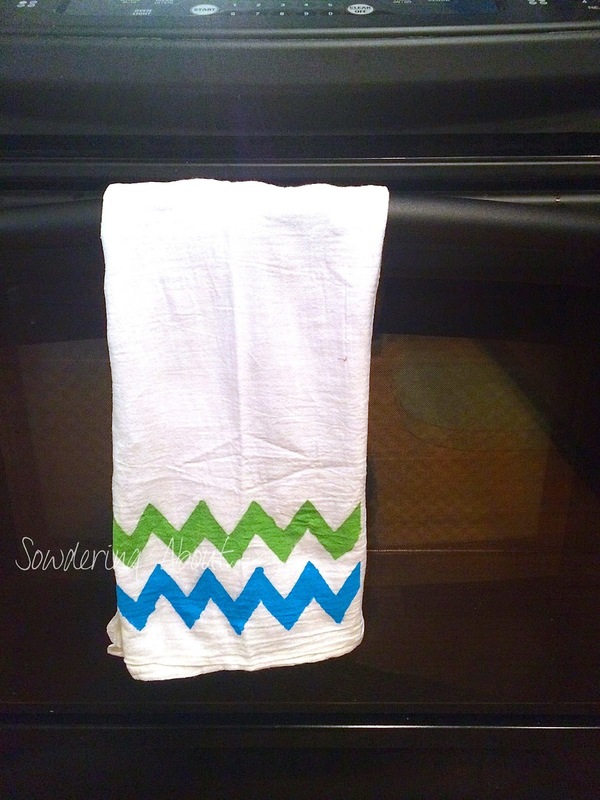 Love the chevron print and the colors that you choose! Thanks for sharing with us at Pin Worthy Wednesday! I have pinned this to our Pinterest Board! Hope to see you again this week!